Where I grew up, we have very hot summers. We mostly spent the three months of that blistering weather on the beaches that surrounded us, man made of course, but they are beautiful beaches nonetheless. Swimming in lakes and rivers was also a huge part of my childhood. Being home now with my kids a little older this visit, it has been a none stop adventure of showing them all the amazing places and things I used to do. My childhood memories turning into their own childhood memories which is so emotional and amazing to watch. 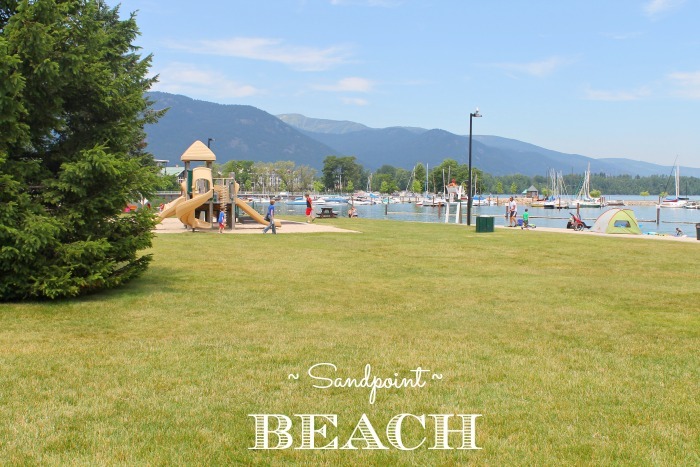 One specific beach, Sandpoint Beach is where I spent the majority of my baby, toddler, childhood, teenage years in summer. It’s right in the heart of the town and two minutes walk to all the local boutiques and restaurants. It has been updated and cleaned up a lot since I was there too which was a great bonus. The jungle gym is all new and twice the size it used to be. 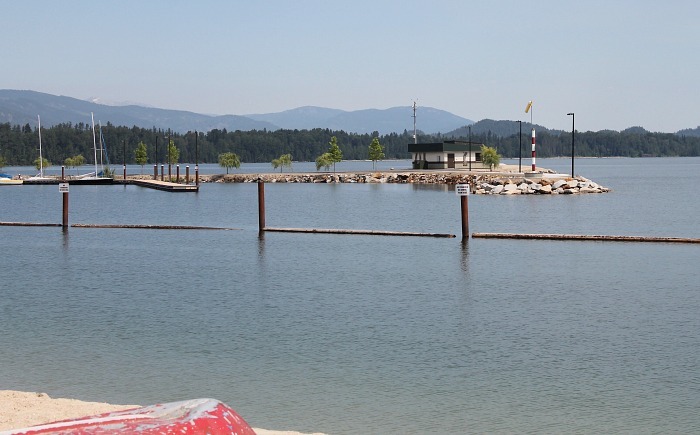 There are kiddy pools, tennis courts, ice cream and food huts, and the white sand! Nothing beats good sand on a beach. Not mini pebbles but true soft sand between your toes. 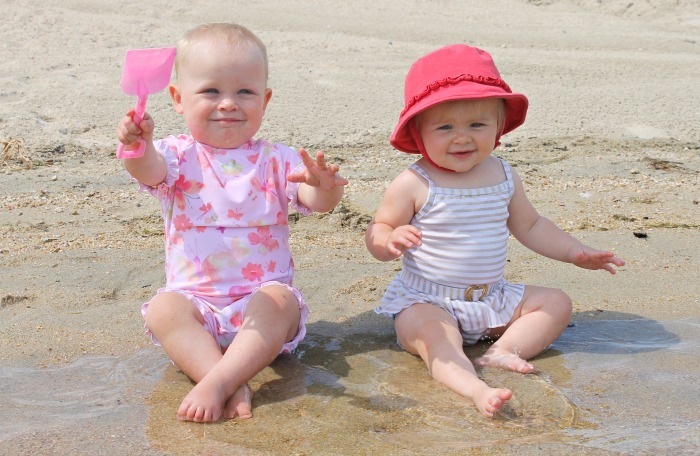 Missy Moo was ever so excited for her bestie, Kinley to join her on the beach. Kinley is the daughter of my best friend R, who I have been close with my entire life, she is more like a sister to me. I have blogged about her before and how we had our daughters on the same exact day! What are the odds? Now, our daughters can become best friends as we did and neither of them need encouragement to love each other. It’s a friendship made in heaven right from the start just like their Mommas. As usual it’s always hard to get the tots to be cooperative for a family photo. 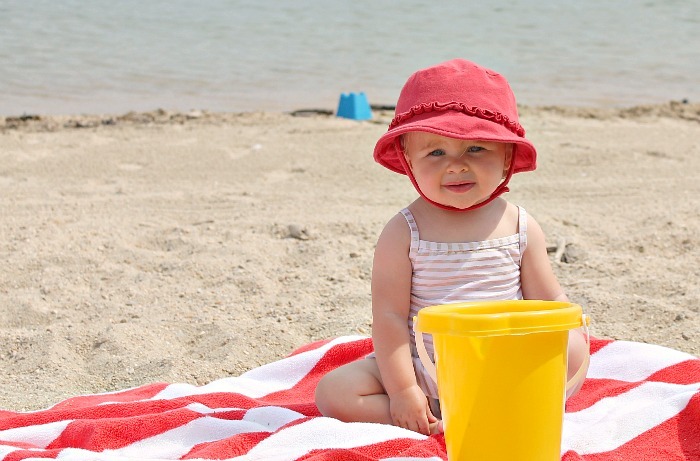 I would highly recommend recruiting extra hands when having a toddler and a baby at the beach. I was a lifeguard for five years and the skills they taught us never fade away nor does the caution. I was a nervous wreck watching Buba freely belly flop in and out of the deep water and Missy Moo trying to jump out of my arms to swim like her brother. I definitely will be bringing a life jacket with me next time and some help. 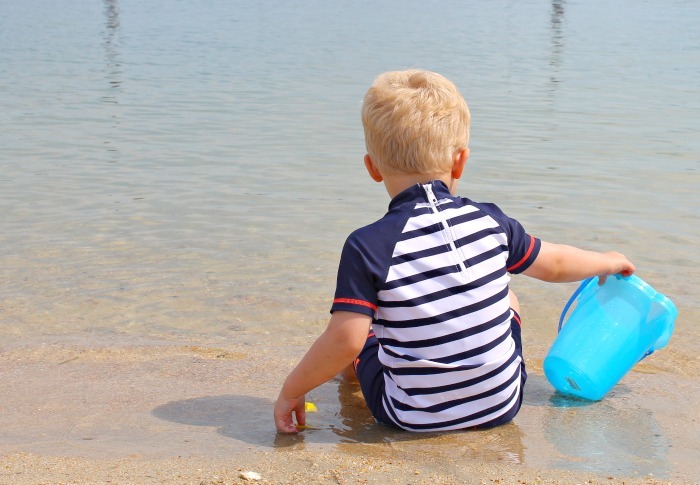 Buba was in heaven as much as his mother was to be at the beach on such a sunny summer’s day with his sand bucket and shovel in tow. The water was refreshing from the heat. I love how the sand slowly flows out into lake so the deep water is a bit further out. It allows Buba to be able to wade out to his waste without being too deep, too soon. I have so many special memories of me doing this very thing with all my cousins. We used to have contests to see who could build the biggest sandcastles and whose was the most creative. We would dig mini lakes along the shore line so water would come in and out of mini tunnels we created. Our creativity was endless and we never got bored of the beach. The views are stunning too. Normally on a beach you look out into the ocean which is beautiful but this beach has gorgeous mountains all around it and sailboats everywhere. The houses along side this lake are to die for too. We are talking mansions galore looking over the lake. 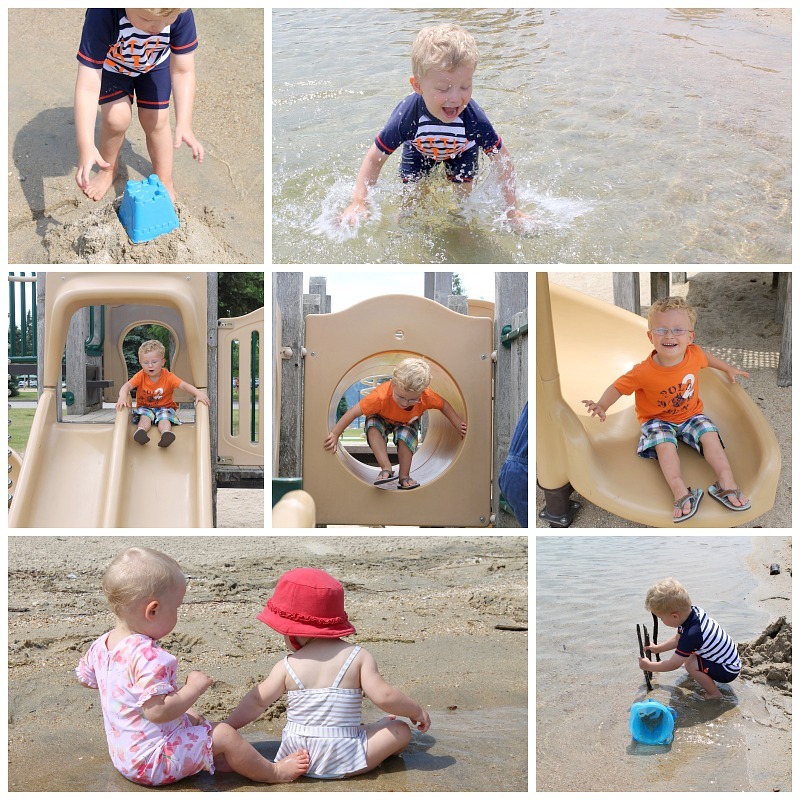 After a gorgeous morning building sand castles, swimming in the lake, and catching up with our friends it was picnic time. The kids love a good picnic but they were even more impressed with a beach picnic. Eating their lunch with sand still between their toes and looking out into the water. 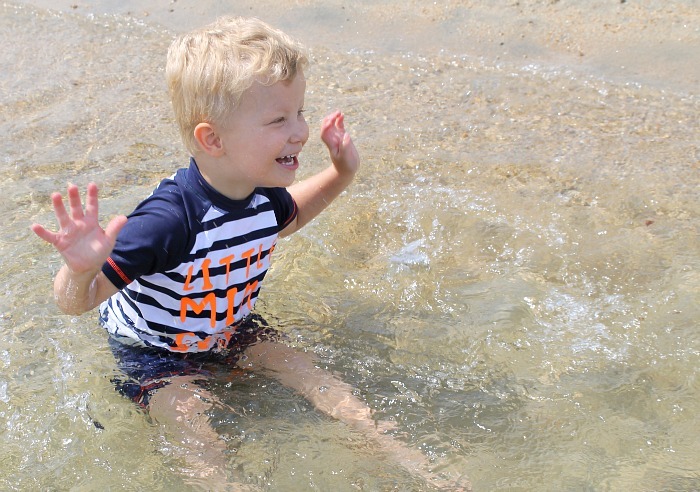 We had a few more splashes in the water before it was nap time. Thank goodness for the snooze shade. Keeps the sun out and the air flowing. Something I would highly recommend to anyone traveling with kids especially in the sun. While the kids took their stroller naps, R and I decided to have a ladies lunch over looking the water. 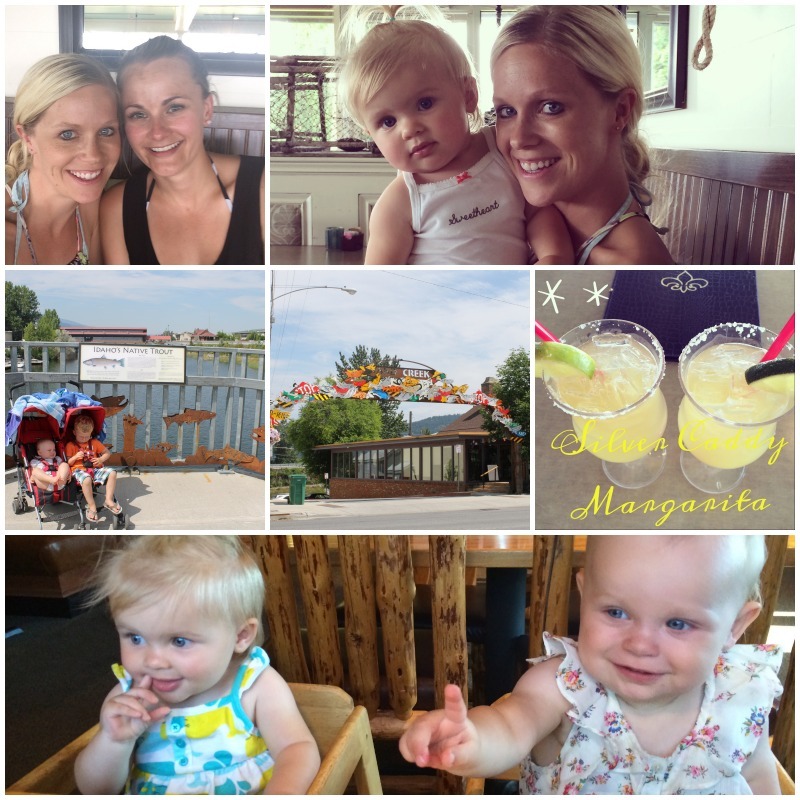 The food was great and we may have even enjoyed a nice icy glass of Silver Caddy Margaritas! It wasn’t long before the kids figured out their mommies were enjoying themselves and woke up to join in. After lunch we strolled around the town, checking out the little boutiques. There is a bridge you cross that now has steel trout figures swimming along it. They have really updated the town as much as they have the beach. There are corky, artist crafts all over like the arch you see below made completely out of old road signs. 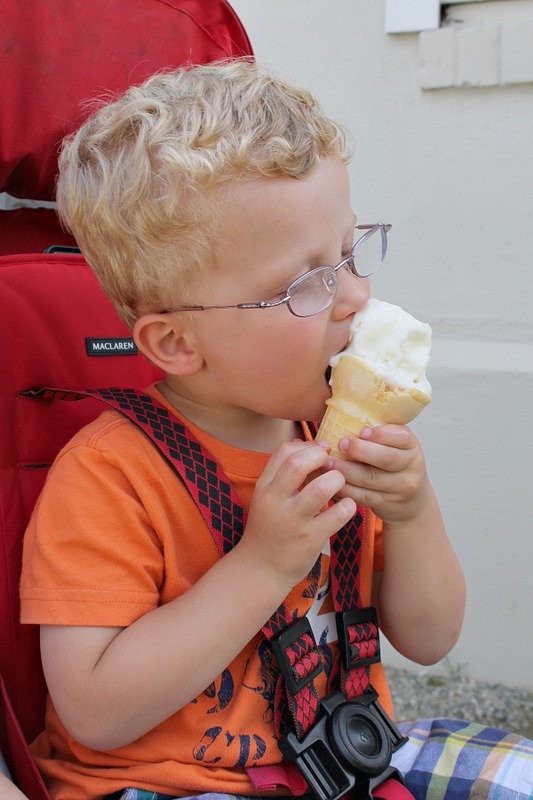 It wasn’t long before it was time to hit the beach again and enjoy a nice ice cream cone for a perfect end to our amazing beach day. It was Buba’s first ever, whole ice cream cone and Missy Moo’s first few licks of ice cream along side Kinley. I think it’s safe to say Buba was in heaven! Buba took to the jungle gym while the girls played in the sand one last time exploring the water edge. Overall it was a fantastic day at the beach with our best friends. A day trip that we will continue to take over and over while we are here in the states. 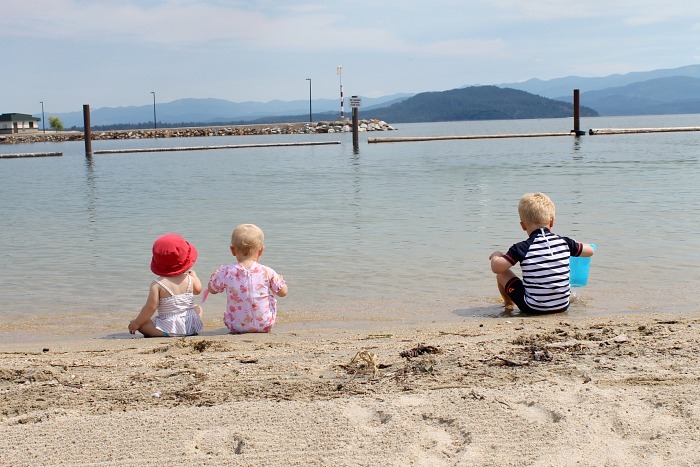 There is nothing better then fun in the sun, at the beach, together as a family. Mr P gets here Sunday and we are so excited to take him to the beach with us. What’s a beach visit without a baby being throw in the air? Missy Moo absolutely loved it as did Mommy listen to her squeal in delight! 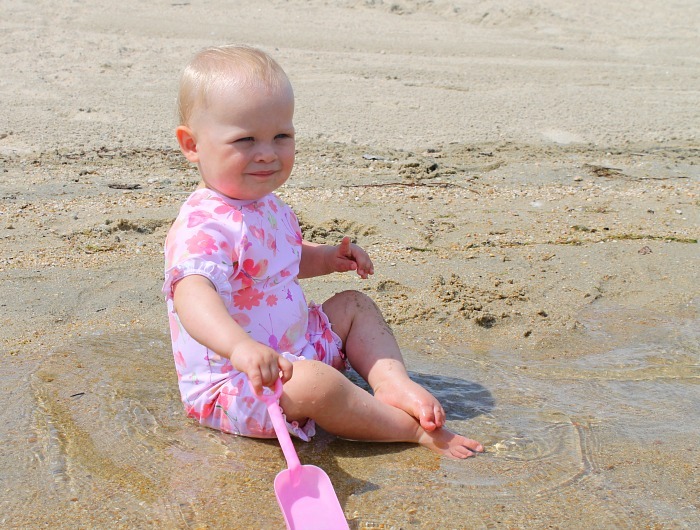 It’s safe to say my kids are beach babies just like their Momma! Sounds like an awesome place to hang out for the summer Jenny! Kids look like they’re having a blast, and your suntan is coming along very nicely 🙂 great photos as always! Thanks I needed a little tan. Think I was the whitest I have ever been ever. Lol it’s a great trip so far. Sounds like an amazing place to have grown up in & now you get to share it with your own kids. Here’s to making lots of special memories and having a great summer. Fabulous photos as always. Thanks Beth, I hope the weather is good for you too! Enjoy your trip. Beautiful photos, it looks like you had an amazing time. Can’t believe your best friend had her daughter the exact same day as you! Thanks Katie. I know me too, I don’t know of one close to me in Manchester either. Boo. Living by the sea would be amazing. I have always lived near water. My parents house sits on a river so it was always amazing to listen to the water out the window while I slept. Makes us all great swimmers too! lol It’s been a great adventure already back home and so many things upcoming next week. Mr P and my five siblings are all flying in for a family reunion. I can’t wait. Thanks Lucy! Yes there is always plenty of sunshine here all summer that’s the beauty of staying so long during the summer months it’s guarantee weather. One of the reasons we got married here among a million emotional ones too! lol It’s been such a great trip already and so many amazing things to come. I have all my siblings and their families and Mr P flying in Sunday so next week is going to be busy but absolutely amazing. I am so excited. I know everyone from back home is always talking about it as they know how inseparable we have been our whole lives and not only the same day but 3 hours a part to the minute and both girls! lol Fate. Thanks we are having a great time here and it’s so great to be home. Thanks Caroline for your beautiful comment. Yes it’s been so amazing and I am so blessed to have such a wonderful family and a beautiful place to call home and share it all with my kids now. I hope you are feeling good and all is going well. Thanks for linking up and the continual blog support. Yes do you wouldn’t regret it. Its amazing here. So beautiful, so fun, and so many amazing things to do with families. I had a great childhood here too. I only wish I could do the same and move back. Maybe someday. It is extremely hard not having any family around for my kids but I am grateful I get to come home for two months each summer with them. haha Ya I was a lifeguard and taught swimming lessons to babies up to 15 years old for five years. I loved it. Thanks the beach was amazing. What a neat place! It looks beautiful and everyone had so much fun! Thanks, it was a great place for the kids to run and play. We had a blast and are going back today. Love having a beach close. Firstly, wowza. You look awesome in your bikini! It’s so spooky and lovely that your bestie had her baby on the very same day. Their friendship is meant to be, just like yours! Such lovely pics Jenny and so lovely for you to be making wonderful memories! There are few things better in life as a parent than when your little one ‘clicks’ with a close friend’s child. I have that too 🙂 They weren’t born on the same day but only 2 days apart! Oh two days a part is still amazing. Yes you couldn’t be more right. Thanks for the lovely comment. Fab photos. It is a priceless experience to be able to share your childhood haunts with your children. Thanks Louisa. It truly is priceless. I am so grateful I get to have them here for the entire summer, in my hometown, in my culture soaking it all up!!! It’s already been amazing and we have lots more coming up! hahaha I will send some back with Mr P in a jar for you! lol Yes it’s been absolutely amazing and we have so many grand adventures still to come!!! Thanks Jess. We really did. Off to the beach again this week. I could spend the whole summer everyday there. It’s amazing. Oh gosh, it was an illusion with my kids hiding all the bad bits. hahaha but thank you so much. It has been so magical. Thank you so much. So sweet of you to say. It’s amazing here!! Who wouldn’t love a day like this? Family fun at it’s best with the most wonderful photos. A truly happy day, thankyou for sharing on Country Kids. Thank you Fiona. Yes of course, we taking many many outdoor adventures I hope to share if I can keep up with it all on vacation. lol It’s a stunning place to make memories. Great post! How nice to be able to share places your favorite places growing up with your own kiddos. Thank you Keitha. It’s been amazing sharing such great memories with them where they are now making their own memories in the same place. It’s a stunning place to grow up and I wish I had the opportunity to bring them home more. Thank you so much. It really is, I have missed it so much lately especially now that I have kids. I couldn’t agree more, ice cream makes a beach day perfect. Thanks. The beach looks beautiful, and it sounds like you have lovely childhood memories! Thank you Hayley. It really was the perfect day we keep going back. Taking Paul next week to the beach. Can’t wait. Looks like an amazing family day at the beach! Oh and can I just say I LOVE your swimsuit! Thank you so much I think it was a cheap swimsuit from forever 21. The beach was so fun. We are going again this week. Can’t get enough. Love the photos Jenny. Your babies are so cute and I would just love to live by a beach like that. Thanks Sonia. So sweet of you to say. I wouldn’t go as far as gorgeous you are too kind. We had a blast and can’t wait to go again next week.